PULLMAN, Wash. — “Silent Sky,” a play telling the story of the Harvard Observatory “computers,” a group of women who crunched massive amounts of astronomical data at the turn of the twentieth century, will open Friday, March 30, at Washington State University. Written by Lauren Gunderson and directed by Mary Trotter, the six performances will be held March 30-31 and April 6-7 in Daggy Hall’s Jones Theatre, with nightly performances at 7:30 p.m., and 2 p.m. matinees on Saturdays. The last three performances coincide with Mom’s Weekend at WSU. The play focuses on real-life astronomer Henrietta Swan Leavitt, played by Avery Barnwell. Leavitt’s discovery of the period-luminosity relationship of certain stars offered a breakthrough in man’s ability to gauge distances through space, and ultimately the size of the observable universe. As Leavitt attempts to measure the light and distance of stars, she must also take measure of her life on Earth, balancing her dedication to science with family obligations and the possibility of love. Reserved seating for most shows costs $10 adults, $8 seniors (ages 60 and up), and $8 for all students and youth. A discounted rate of $6 per person is available to groups of eight or more. Admission to the March 31 matinee will be free, sponsored by the WSU College of Arts and Sciences. A dessert reception with Trotter and her cast and crew will follow the performance immediately. Seating is limited, and tickets are available in advance. Tickets are on sale now at all TicketsWest outlets, including online at TicketsWest.com, by phone at 800-325-SEAT, and in person at WSU’s Beasley Coliseum ticket office and the Rosauers Supermarket in Lewiston, Idaho. Service charges apply at all locations except Beasley. The Daggy Hall box office will open two hours before each performance for ticket sales and will-call. “Silent Sky” offers a glimpse of the difficulties women in the sciences faced in the early 1900s, but it also offers inspiration to audiences of all ages. When Henrietta Leavitt begins her work at the Harvard Observatory, she and her fellow computers are not even allowed to use the telescope, and the observatory’s director discourages theorizing. That cannot prevent the women from making discoveries and changing the way we understand both the heavens and Earth. Leavitt’s colleagues in the play include two other astronomical “hidden figures,” Annie Jump Cannon, played by Emma Dexter, and Williamina Fleming, played by Ann-Jeannette Seymour. Gunderson is the most produced living playwright in America, winner of the Lanford Wilson Award and the Steinberg/ATCA New Play Award (for “I and You”). Her work has been commissioned, produced and developed at companies across the US and published by Dramatists Play Service, Playscripts and Samuel French. Parking for each performance will be available without permits or fees in the Daggy Hall parking garage and in the Green 3 lot directly across the street from Daggy Hall. 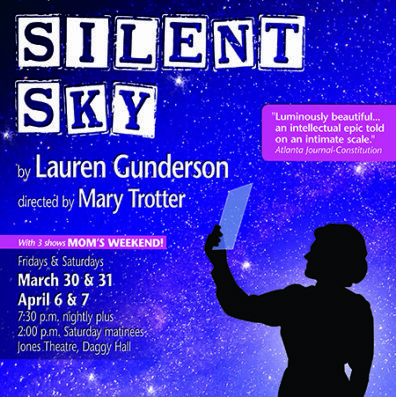 “Silent Sky” is presented by WSU Performing Arts by special arrangement with Dramatists Play Service, Inc. The WSUPA season is presented with generous support from the Residence Inn by Marriott Pullman and Courtyard by Marriott Pullman.